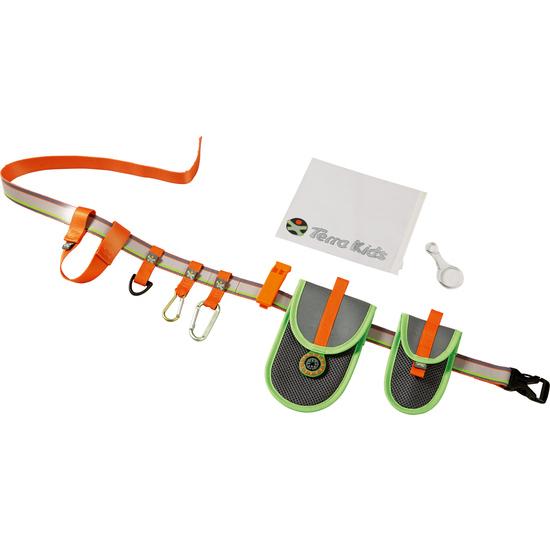 This belt offers lots of space for everything that little explorers and discoverers need on their adventures. Be it an mp3 player, a little digital camera or other electronic devices ... everything can be stored safely in the big pocket with hook and loop fastener. Compass attached. The small pocket has a magnifying glass with 3x to 6x magnifying capacity. Includes 2 different sized aluminum snap links, a couple of loops and an emergency whistle.